Netwrix Auditor for SharePoint delivers security intelligence about what’s going on in your SharePoint environment. 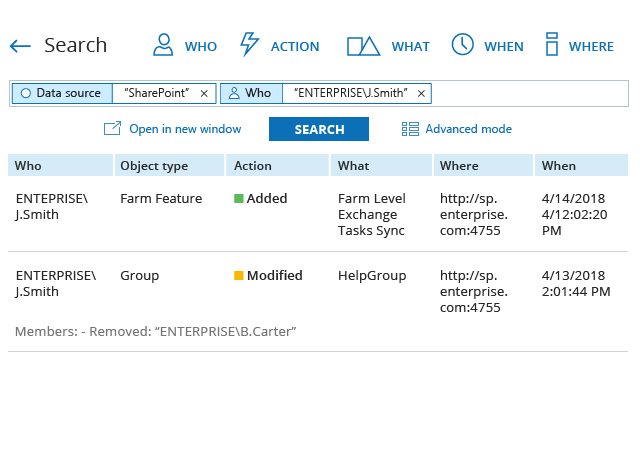 See who has access to what and track changes to farm configuration, groups, permissions and user content, as well as document reads, to mitigate the risk of data leaks, maintain SharePoint availability and streamline IT compliance. Empowers you to quickly find out how exactly permissions were granted and identify broken inheritance, so you can create a more manageable and secure SharePoint environment. Gives you valuable information about every change across your SharePoint platform: who made each change, when and where it was made, and exactly what was changed, with the before and after values. Reports on who viewed which documents and lists on your SharePoint sites and when each read event occurred, so you can make sure that corporate data is accessed only by authorized personnel and improve your SharePoint document auditing. Contains sets of out-of-the-box reports mapped to PCI DSS, HIPAA, FISMA/NIST, GDPR and many other regulatory compliance standards. Prove to auditors that you perform regular SharePoint security auditing and that your internal controls are aligned with security best practices. Makes it easy to quickly determine the root cause of an issue or investigate a security incident. Quickly find out who made unwarranted modifications in central administration or accidentally removed an important document from SharePoint. Keeps you current on the changes and access events you deem most critical, whether it’s massive removal of data from a SharePoint library or unauthorized changes to site collections. Provides a single view of all anomalous activity alerts triggered by an individual across your whole IT infrastructure. Detect malicious insiders and compromised accounts in a timely manner, so you can respond before it's too late. Simplifies SharePoint security monitoring by pinpointing subtle indicators of threats that might jeopardize the security of your SharePoint, such as suspicious activity outside of business hours or the creation of potentially harmful files on your SharePoint sites. Automates SharePoint auditing with multiple predefined auditing reports and high-level dashboards that offer drill-down, filtering, sorting and exporting capabilities. Subscribe to them to have this information emailed to you on schedule. Helps speed the investigation process by presenting key details about user accounts involved in incidents in a single place. Enables you to automate response to common and anticipated incidents by embedding scripts in alerts, so you can ensure a prompt response while staying focused on more important tasks. Performs the collection of SharePoint audit data without the use of any intrusive services, so it doesn’t degrade SharePoint Server performance or cause any downtime. Without third-party solutions, SharePoint admins have to spend many long hours crawling through the SharePoint audit logs in an attempt to dig out the root cause of a security incident, investigate what change caused downtime, get evidence of their company’s compliance with security best practices, or prepare audit log reports for management. Most SharePoint auditing tools can’t address all these needs. Netwrix Auditor can. If users have excessive permissions to critical data on your SharePoint Server, their actions can accidentally lead to a data leak or put you at risk of non-compliance. 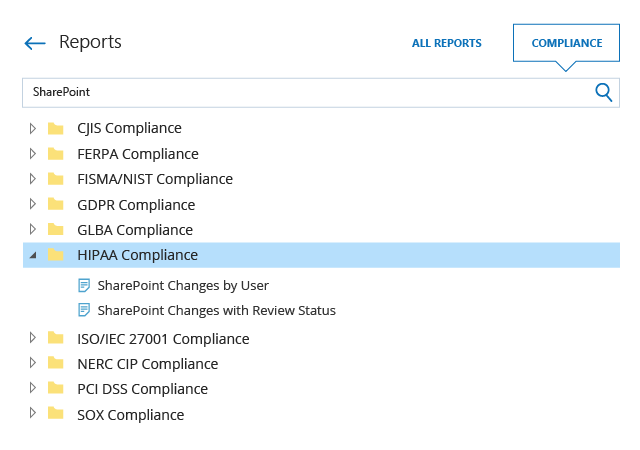 Regularly review and analyze Netwrix Auditor’s reports on SharePoint permissions to make sure everyone has the right level of permissions and critical data is not overexposed, so you can prevent data leaks and compliance violations. Changes to the Farm Administrators group settings, site collections, lists, permissions and content often go unnoticed until the organization discovers a breach, fails a compliance audit or experiences downtime. Netwrix Auditor provides comprehensive SharePoint change auditing and reporting along with customizable alerts, so you can detect critical changes and respond in a timely manner. Instead of manually sifting through cryptic audit log data, use Netwrix Auditor's Interactive Search any time you need to quickly determine who has done what with your sites, lists, libraries, content types, list items, library items or SharePoint permissions. Configure custom reports based on your search criteria to stay informed about similar activity in the future. Easily prove your compliance with the requirements of a large number of standards, including PCI DSS, HIPAA, GLBA and GDPR, using out-of-the-box compliance reports. Use the Interactive Search to quickly sort through the SharePoint audit trail whenever you need to respond to specific questions from auditors. Learn more about how Netwrix Auditor for SharePoint helps organizations just like yours simplify SharePoint auditing and streamline regulatory compliance. 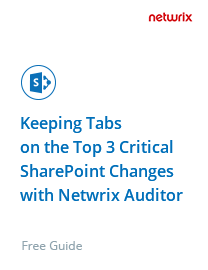 See how you can enhance the security of your SharePoint by keeping tabs on the top 3 critical SharePoint changes with this powerful SharePoint auditing tool from Netwrix. Consilink secures PHI and saves $200,000 annually on user activity monitoring with Netwrix Auditor. Netwrix Auditor helps Palmer College of Chiropractic increase accountability of privileged users and stay compliant. The Georgia Lottery ensures the safety of PII and other sensitive data using Netwrix Auditor. Unigarant uses Netwrix Auditor to protect customer data and prove compliance in two minutes instead of two days. Microsoft SharePoint helps organizations improve their effectiveness by streamlining both data access and data management. Staying on top of changes to SharePoint site collections, configuration, security settings, document libraries and list items is crucial to the security of sensitive content and the continuity of business operations. Netwrix Auditor for SharePoint tracks changes and read access events to detect suspicious activity, and enables you to easily view detailed information about any action, including the creation, deletion or modification of critical SharePoint content. This pervasive visibility into SharePoint activity helps you minimize the risk of data compromise and operational setbacks. 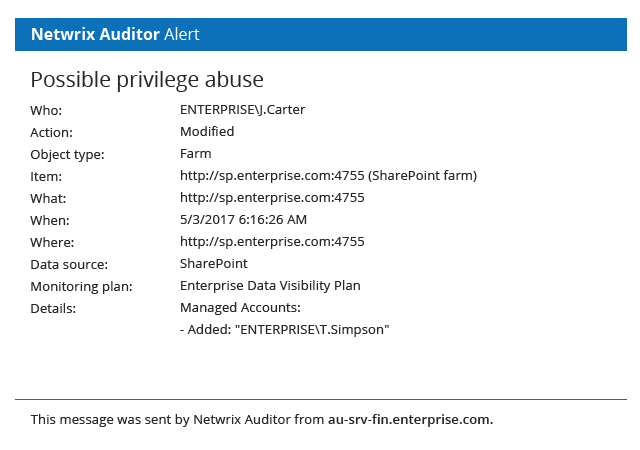 Netwrix Auditor for SharePoint complements Microsoft SharePoint monitoring by detecting, preserving and reporting on all changes to the configuration of SharePoint farms, permissions, user content and other resources, as well as all read access events. It provides extensive details, so you can easily determine who viewed which data, who changed what, when and where each event happened, and the before and after values for each change. The solution provides easy-to-read predefined reports and dashboards, along with report subscriptions, interactive search through audit data and a cost-effective two-tiered (SQL Server database + file-based) storage. Continuous auditing and reporting of SharePoint changes is essential for maintaining the proper levels of security and availability. Netwrix Auditor for SharePoint offers extensive reporting capabilities for continuous SharePoint change management: predefined reports and dashboards with filtering, grouping, sorting, exporting, email subscriptions, drill-down, Web access, granular permissions and the ability to search through audit data and create custom reports on any SharePoint changes. These features help organizations detect issues that negatively impact security and business continuity and quickly remediate those problems. 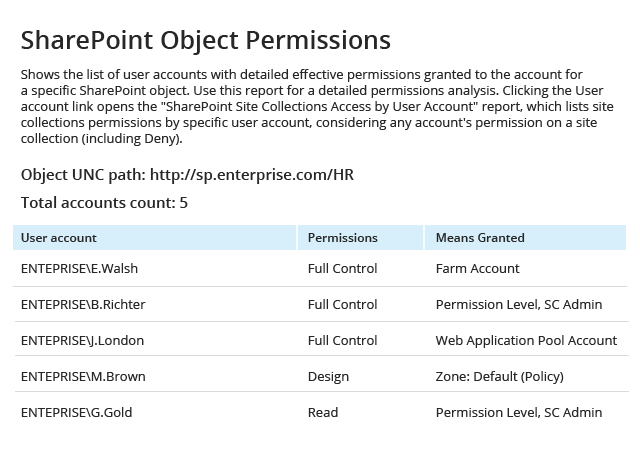 Proper SharePoint governance requires controlling user access to each site and its contents. Whenever any change is made to permissions — whether permissions to sites, lists or data were modified, or a new member was added to a SharePoint group — you need to be alerted, because improper changes can threaten your data security. For efficient permissions management, you need visibility into permissions and how they change. Netwrix Auditor for SharePoint delivers actionable intelligence, including SharePoint permissions reports that you can view at any time to determine which users gained access to your sites and whether their permissions are appropriate. Does your organization rely on SharePoint to store and manage critical information? If so, to ensure data security and system availability, you need to keep a close eye on all access events as well as all changes to configuration, list items, library documents, permissions and more. To view audit log data, you can configure the native SharePoint audit log in Site Collection Administration. However, SharePoint audit log reports come in a hard-to-read Excel format and don’t enable you easily identify and scrutinize suspicious activity. Netwrix Auditor for SharePoint, on the other hand, delivers actionable intelligence enriched with valuable insights, so you can quickly spot abnormal actions and drill down to investigate them, thereby minimizing the risk of attacks or insider misuse going undetected. More and more healthcare organizations are using SharePoint to streamline their business processes and organize their data. However, they must ensure that their SharePoint environments meet HIPAA and HITECH Act compliance requirements for storing and processing patient electronic protected health information (ePHI). Netwrix Auditor for SharePoint enables you to make and keep your SharePoint HIPAA compliant. The solution addresses HITECH and HIPAA security requirements by helping you validate that your critical assets are secure and mitigating the risk of a breach with notifications on insider and outside threats — while also slashing audit preparation time and costs. Does manually generating reports with native tools in order to monitor activity on your Microsoft SharePoint sites take up way too much of your precious time? Stress no more, because the SharePoint reporting tool from Netwrix delivers insightful, easy-to-read reports on everything that is happening across your SharePoint Server, from changes to user data and permissions to read access events and more. Critical details help you spot aberrant activity faster, so you can quickly remediate threats that jeopardize data security and system availability. Plus, automated delivery of reports on the schedule you set slashes your report preparation time. Do you have peace of mind when it comes to security of your SharePoint data? Misuse or exfiltration of sensitive data, whether it’s business-related data or personal information belonging to your employees or your customers, can result in a costly breach and harm your organization’s reputation. Therefore, ensuring SharePoint data security and compliance is essential. Netwrix Auditor for SharePoint delivers easy-to-read, detailed SharePoint reports so you can stay on top of what’s going on across your SharePoint sites and spot unauthorized attempts to access your sensitive assets before it’s too late. While Microsoft SharePoint fuels collaboration and content sharing across your organization, you should always keep in mind that some of this content might be highly sensitive. To minimize the risk of a breach and prove your compliance with regulations such as PCI DSS, HIPAA and GLBA, you need to have efficient records management, data loss prevention (DLP) and data access governance strategies in place. 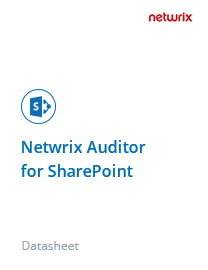 Netwrix Auditor for SharePoint helps you streamline SharePoint compliance by delivering reliable compliance features, such as predefined compliance reports, report subscriptions and full-featured interactive search. Now you can slash audit preparation time by 50% and address any auditor’s question within minutes while shielding your critical information from outsider and insider threats. Securing the sensitive data stored in Microsoft SharePoint Server is an important task for IT teams. To strengthen the security of your SharePoint site collections, you need to be able to quickly spot, investigate and remediate any suspicious change to your farms, web applications, sites, lists, list items and documents — especially SharePoint permissions changes. While native audit log reports can provide you with some information about changes to your site collections, they do not deliver any capabilities to help you spot malicious activity in its early stages or get to the root cause of an incident. Netwrix Auditor, on the other hand, enables you to stay on top of suspicious activity easily. Prebuilt and custom SharePoint security reports and other features enable you to quickly spot problems and determine the root cause, so you can respond promptly and prevent similar incidents from happening in the future.